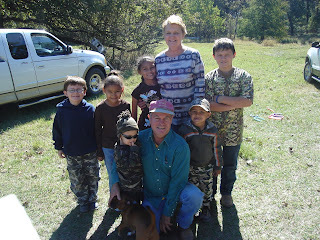 The kids love to hang out at the farm with their cousins and of course, Nana and Papa. We spent Mother's Day weekend there and we had a blast!! Logan caught his first fish and as soon as I figure out how to upload pictures from my new camera(my mother's day gift) I will get a picture of Logan and his fish!! I Love this picture of my sister with all of her grandkids, it made my eyes water! Wgat a great family, I can't wait to hopefully bring Jasmine to the farm one day to meet all of her "Texas" cousins!